When we were in Georgia, my parents had a lot of produce from the garden that we needed to eat. I went flipping through Southern Living to see if I could find a good recipe for the abundance of squash that we had. We decided to give this recipe a try and we all LOVED these fries - even my picky eater sister! You can definitely take some shortcuts with this recipe, but don't do it the first time you make it. Follow the ingredients and directions to the T so you know just how good these are. 1. Combine 2 cups flour, next 2 ingredients, and 1 tsp salt in a shallow dish. Whisk together eggs and 3 Tbsp water in another dish. 2. Process breadcrumbs in a food processor 10-15 seconds or until finely ground. Combine breadcrumbs, 4 Tbsp flour, oregano, pepper, and remaining 2 tsp salt in a third shallow dish. 3. 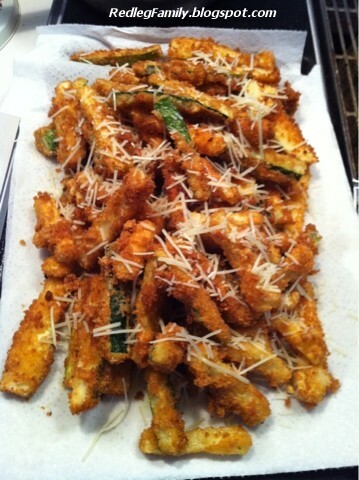 Dredge zucchini, in batches, in flour mixture; dip in egg mixture, and dredge in breadcrumb mixture. 4. Pour oil to depth of 2 inches into a Dutch oven; heat over medium heat to 325 degrees. Fry zucchini, in batches, 1 to 2 minutes or until golden. These are so good as is, but try dipping them in ranch dressing too! These look DELISH! I never thought I could love fried green beans, but have fallen in love, so I KNOW I am going to try these.